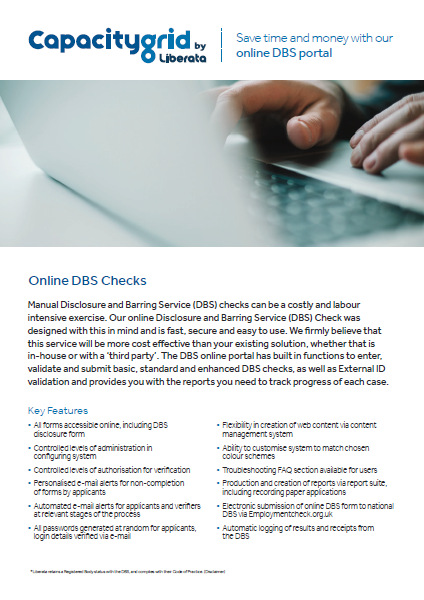 A Local Authority, School or other organisation input applicant details along with level of check being requested (basic, standard, enhanced DBS, or Disclosure Scotland). A Recruiting organisation check applicants proof of identity via witnessing of original documents e.g. Passport, utility bills. The application is then received by Liberata DBS registered staff to validate application prior to submission to DBS. Once submitted, progress and status of the application can then be tracked online. Save time and money with our online DBS portal. Get a quote today and identify the savings from using this solution.